Ok things are getting out of hand. Let's say, my Disney obsession is getting out of hand. And the scary thing is, I'm dragging Benn in with me! He's supposed to be the voice of reason and he's failing miserably at his job. Thank God. I got an email yesterday (I'm sure many of my fellow AP holders did, too) announcing that a "Villains Unleashed" party is coming to DHS on August 23. It sounds just like the Friday the 13th party last September, but at least they have wised up and are now selling it as a hard ticket event, so the gridlock and the taking two + hours to get to DHS and people missing the party issues should be solved. We are rather seriously considering flying down Saturday morning and flying home either Sunday afternoon or Monday afternoon. I have enough DVC points to do Saratoga for one night. Can't decide what to do about the other night if we stay until Monday. I'd need to rent like 10 points I think to do both nights. But then if I use the points now, I can't apply them to Grand Californian in March (I'd have to borrow the entire allotment from 2016 points since we borrowed our 2015 points to make the marathon year-o-disney happen). The real hold up is that the best price on flights I could find was $470 RT for both of us. I miss the days when you could fly Southwest BWI-->MCO for $69 each way. For $300 flights, this baby would have been booked last night! Plus, our AP means that we don't pay extra to, say, pop over to MK and ride 7DMT, but we still have to pay for the party tickets ($67--not much more than MVMCP or MNSSHP). The kicker is that because of the difference in price to fly home monday, it would cost us the same amount to go Sat-Mon. as it would to go Sat-Sun. Unfortunately, Benn is out of vacation, so it means that have would have to work major overtime all week when we got back to make up his time. I think it sounds amazingly awesome -- 50 villains out and about (I'm not sure that I can even list 50 Disney villains off the top of my head!!) AND they are running "Villainy in the Sky", which is THE best fireworks show I've ever seen...and I've only seen it on YouTube. It's gonna sell out for sure, so I know it's going to be crowded, but it sounds like soooo much fun. What do you guys think? We never do anything crazy. Should we go for it or just be happy with MNSSHP? Is anyone else going?? Do it!!!!! I'm sitting in England trying to rationalise a trip similar to this however mine would involve a LOT more money and unless I come into some serious cash in the next few days its not going to happen, yours is a lot more manageable than our so I would say for the benefits of the forum and the amazing opportunity go for it!!!!!!! It's the Saturday before our trip starts and DH and I were seriously considering whether we could swing extending our trip by a week to go! The decision was made easy for us when it was announced the party already sold out yesterday within a couple of hours. Oops, retract my earlier statement. Apparently they were only temporarily out of tickets?? It's been on sale only for DVC and AP holders. They probably put some aside for regular guests when that window opens up on June 9. So this is actually happening!! OMG. I can't believe it! Got a flight on Frontier (never flown them before ) for $316 RT from Dulles to Tampa. It's a total budget airline, so we did add on extra stuff, but we're getting 36" of leg room and paying for a carry-on and STILL paying $130 less than the cheapest southwest flight from BWI to MCO. So no claustrophobic panic attacks and we got to choose our seat. Sweet. We're renting a car anyway, so no problem there. Hotel is another issue. We were going to do the 1-time-purchase points from DVC to make up for our point deficit, but it would cost us $150 on top of the "real cost" of $132 for borrowing our remaining 22 points from 2015. SO we thought about using this opportunity to check out AoA ($270, but checks off an item that we do want to do) and that is still a possibility, but the more practical approach is to choose one of $40ish/night hotels on 192. So had anyone stayed on 192 and how bad are the $40/night hotels really?? Seem like some decent hotels. Found this. Don't know if it will help. Just remember, most times, you get what you pay for. I'm sooooooo happy for you and soooooooooooo jealous!!! you need to take LOTS of pictures and share them with us all so we can pretend we were there with you!!! Oh, heck, I can help you out with that. Well, you've got the Evil Queen as your avatar, so that makes sense. 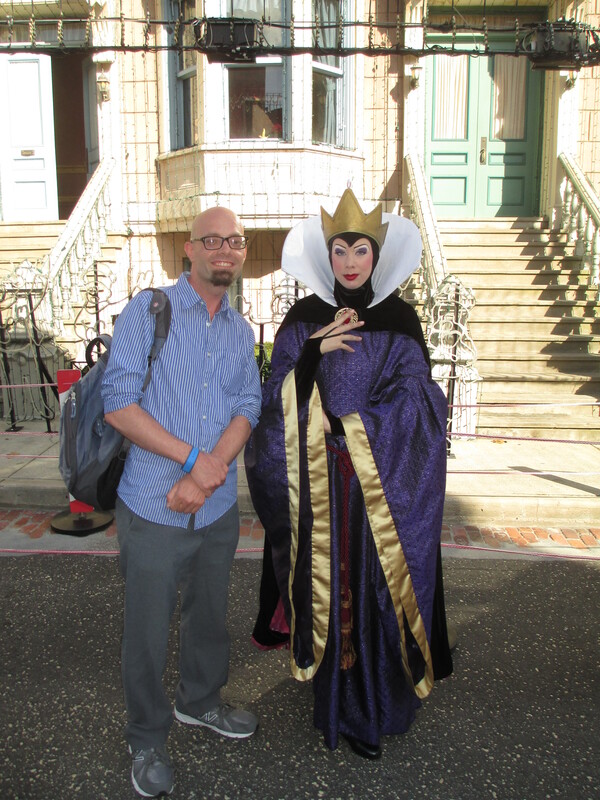 Great Evil Queen pic, Matt! We'll be flying in to Tampa--can any of our local Florida friends shed any light on the toll situation? The rental car people always try to see you the toll pass thing, but I assume that they are just trying to rip me off. Does anyone know if we will encounter tolls from TPA to WDW? Are any cashless? Is there a better way to go than I-4? From the airport, take I-275 North to I-4 East, you will not encounter any tolls at all. I-4 Exit 62 is the first Disney exit. Depending on the time of day, you could be there in about an hour. (If you hit rush hour, you are on your own). It's the most direct way (and the easiest, IMHO). We'll depart from Dulles airport at 12:55 and arrive in Tampa at 3:15. We're flying Frontier airlines, so absolutely everything about this trip is new to us. We've never flown out of/ into either of these airports and we've never flown Frontier. We used to live 10 minutes from Dulles, but we've never used the airport because that was right after we were married and we didn't have enough money to fly ANYWHERE. Well, I suppose we could have flown places, but we would have had to give up something else like paying rent or eating... If you're not familiar with Frontier (I wasn't) it's a budget airline where you can get super low fares, but you pay a seat premium and a carry-on fee if you take more than a personal item. Since it's a 3-day trip, we're sharing a carry-on and I joined their little Frontier club and saved $5, so whatever. Their base ticket was $200 cheaper for the two of us RT than Southwest out of BWI. In fact, I'm paying to carry on a bag both ways and I upgraded us to the 36" leg room seats both ways and STILL paid $100 less than the total fee would have been on Southwest from BWI to MCO. Score. The only caveat with these folks is that they only fly certain routes on certain days of the week. We just happened to luck into the days they were flying to IAD-->TPA. If all goes according to plan ( no storms, random delays, etc. ), we should be in possession of the rental car and on the road by 4pm. I haven't rented the car yet because rates are still too high, but we'll probably rent rom Dollar when their next sale comes out as they have consistently been the cheapest. Fortunately it's Saturday, so hopefully no rush hour traffic patterns to contend with and the TB Rays are playing in Canada, so no game day traffic to contend with. (I don't know where the stadium is at in relation to the airport, but I know that I steer clear of Baltimore when the Orioles or Ravens are playing unless I've got tickets.) This should put us at the Dolphin by around 5:15. We'll check-in at the Dolphin (couldn't get a DVC room in the Boardwalk Resorts area for Saturday night on such short notice) and walk to DHS and barring complications, we should be in the park by 6pm. That should give us time to grab some dinner and scope out any character meet & greets that we want to prioritize. I'm hoping for Maleficent, but with the movie being out and doing very well at the moment, that will be an absolute circus. At the 24-hour event, Maleficent + Evil queen was a 5-hour wait. Oy. So we'll see. We're also doing MNSSHP and Villains Bash after the ToT 10-miler a month later, so we might prioritize the villains that are the most rare--like Cruella, Frollo, Mother Gothel, maybe Prince John or the Sheriff of Nottingham? We've not heard a confirmation on anyone except Oogie Boogie and Hades, but after Maleficent and Evil Queen, that's my wish list! The priorities for party time are meet & greets, Villainy in the Sky, which I understand they are enhancing from last year's Friday the 13th show, Fantasmic with special villains party tag, and Oogie Boogie's variety show. After the party, we'll enjoy some sleep. You may notice that early in this post, I was trying to justify the cost at AoA ($120/night) to myself because I really want to stay at AoA and we're nearly out of 2015 DVC points anyway, but after listening to the DISunplugged podcast today where Craig said that last year he and his girlfriend walked to DHS from AoA because the traffic was so heinous, we decided that the Dolphin (40% off--$159/night!!) was an excellent value to be able to have walking access to DHS. Even though it's a hard ticket event, I'm sure it will be sold out if it's not already. The 2nd day tickets were on sale for AP holders, I called with a question and waited 35 minutes to talk to someone. That's a lot of people trying to get into DHS all at once!! I suspect that the walkway will be our best friend--if not on the way in, then certainly on the way out! On Sunday morning, we'll check out of the Dolphin, toss the suitcase in the car, and head for MK. In two weeks, I'll be vigoursly trying to secure a FP for both 7DMT and Anna & Elsa. My third will probably be Peter Pan or BTMR. We'll either grab lunch at Casey's or maybe head over to Bahama Breeze or Earl of Sandwich. This will definitely be a break day because we'll be checking in to BWV (we had enough points for one night and they actually had a room on Sunday night) and we want to swim in the pool since we were too busy playing at the parks in April and we didn't take time to use it. In the evening, we'll either go back to MK or get dinner in EPCOT--maybe Les Chefs or Rose & Crown. We haven't been to either in ages. We haven't been to Teppan Edo in a while either, but our hibachi place at home is way cheaper and I think the quality is even better! On Monday, we'll hit a park (probably MK or DHS) until around 12:30 or 1:00 and then head straight back to TPA to catch our 3:55 flight. On the Monday of the week that a lot of schools start back, we probably don't even need to make FP reservations. Maybe I should try for 7DMT and Anna & Elsa for Monday and try a water park on Sunday. I'd kind of like to go to AK, but I can't do that to Benn in August. It always feels 10 degrees warmer in AK than anywhere else and I'm not trying to kill Benn or make him hate Disney! We should be back in PA around 8pm. So, it's a really quick trip, but I'm pretty excited about it! Thanks for reading and I'll keep you posted when we change things! sounds like you have a great trip planned I'm sitting at my computer green with envy!!! don't know if this helps with you FP+ reservations but for some reason MDE will let me look at MK FP availability for 30 days ahead (I'm not an AP holder) and decided I would scope out availability until its time to book mine!!! and I've found quite a few days where there is still availability for both Anna & Elsa and 7DMT so fingers crossed you should get them!!!!! so excited for your TR!!!!!! We fly from Tampa almost every time we go anywhere. It's a very easy airport to get in and out of. We've never rented a car there (obviously) but our friends do when they come for a visit. They say it's not any better or worse than any other airport in that regard. Saturday travel shouldn't be bad. I-4 is a heavily traveled road any time people are awake and it is not uncommon for serious backups to occur. Might want to plan a little longer travel time to get back to the airport than it took to get to Disney - just as a precaution. I've found quite a few days where there is still availability for both Anna & Elsa and 7DMT so fingers crossed you should get them!!!!! I "test-booked" 7DMT a few weeks ago just to see if availability was likely to be a problem in the fall and I was able to get a FP for July 4 week with no trouble at 30 days out. I'm more worried about Anna & Elsa because with a standby line like that, it has to be one of the most valuable FP at MK at the moment! Assuming of course that meeting princesses is a priority for you. Do you think we're on target time-wise with making it to DHS by 6? I figure even at 6:30, we're still in ok shape. I almost wish I'd have sucked up the extra cost and booked a morning flight on SW...It's so hard to estimate arrival times when there are so many factors to consider. 2 hour drive + airport security and junk + 2 hour flight + deal with rental car company + another hour and a half drive + hotel check-in + 1/2 mile walk--so many opportunities to upset the timetable! I did this earlier this morning and for 30 days ahead (11/07/2014) there were still 7DMT and Anna & Elsa the options it gave me were from 1pm onwards for 7DMT and I think 4.30pm onwards for Anna & Elsa I really want to do both so I'm keeping my eyes open for both! First of all... for going to Villains Unleashed. I hope you have a fantastic time!!!!!! As far as tolls, I can't tell you definitely if there are tolls from Tampa airport to WDW because we take a back way when we go to WDW. But, I was just in stuck in the Orlando airport last night because I missed my connecting flight to Ft Myers and my husband had to come pick me up. We have several tolls each way and I asked one of the toll operators last night if they take credit cards because my DH told me he didn't have any cash on the way to pick me up and he stopped at a store to make a purchase and get cash back because he was afraid they wouldn't take credit. The toll operator we asked told us that it is cash or Sunpass only at any of the tolls. I asked what would happen if we didn't have any cash. He said they print out a piece of paper/bill and you have to mail it in with payment when you get home. They have lots of cameras so if you don't pay in a timely manner, I would imagine that you'd hear from the state of Florida about unpaid tolls. If I were you, I wouldn't buy the Sunpass. If you encounter tolls, it shouldn't be more than one or two total. We had three or four tolls each way for the Orlando airport and it was a total roundtrip cost of $10.00 for 6-8 tolls pass throughs. I think the Sunpass would cost more than that. If you don't encounter any traffic, it should take you about 1 hour 15 to get from the airport to the Dolphin. But the Tampa Yankees, the Tampa minor league baseball team, has a home game that night at 6pm. People love minor league baseball here in Florida and game night traffic can sometimes cause delays. The airport is within 10 miles, or less of Steinbrenner Field, which is where they play. Make sure to choose a route to Orlando that is out of the way of the field, just in case. Anna and Elsa's hours have been extended to 30 mins before park close, and with it came a slew of more FP's, so snagging one hasn't been quite so difficult as it was previously!! Good luck, though! I wish I could book a relatively last minute trip like this one weekend. I'm sure it'll happen when I finally decide to get an AP! If your plane lands at 3:15, then I think it's realistic. You don't have luggage to collect, so the rental car experience will be the only holdup. Once you're in the car, I'm guessing maybe a 75 minute drive to the World. The nice thing about I-4 is that the flow of traffic is usually about 80mph. But of course, I never do that, since the posted speed is 70mph. Exist 62 basically takes you in the back way - you pass right by the Dolphin. One, maybe 2 turns, and you're there. (It will be on your right as you come into the property). Thanks, Scott & Annie for the logistics advice! It's so hard to picture how everything will fit into place until you've done it and it really helps to have reassurance from people for whom the are is familiar!